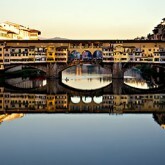 Home » Books » Is Italy Run by the Mafia? Read this Book and Judge for Yourself. 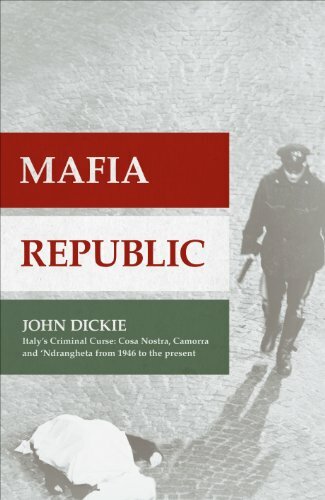 by John Dickie is a book from which which you conclude that the mafia is Italy as much as Italy is the mafia – though by no means all Italians consider the mafia to be at all beneficial to life in Italy. Mafia Republic is Dickie’s latest look at the murky, disturbing world of Italy’s exceptionally powerful organised crime groups, otherwise infamous as the mafia, from 1946 to the present. I’ve read both of Dickie’s previous mafia books, and found them utterly fascinating, if a little worrying. Italy’s three main mafia organisations, the Sicilian Cosa Nostra, the Calabrian ‘ndrangheta and Naples’ Camorra have penetrated extremely deeply into the very fabric of Italy’s society and their influence reaches all the way to the very top. Some of Italy’s leaders have simply accepted that the mafia is here to stay and rumors of state-mafia collaboration are rife. In some areas of Italy, in the mafia strongholds, Italians hold the mafia in much, much higher regard than the Italian state or government. Italy has managed to brush the mafia issue under the carpet for decades. Only after the murder by the mafia of investigators Giovanni Falcone and Paolo Borsellino did Italy, rather reluctantly, begin to wake up to the issue in the early 1990s. Much of Italy’s current anti-mafia legislation was devised by these two Italian organised crime fighters, which is something you will read about in Mafia Republic. 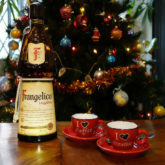 You’ll also learn just how many people have died in various mafia wars – more people died in mafia squabbles than were killed by the infamous IRA – yet Italy did not bother taking the issue the mafia issue seriously. Indeed, Giovanni Falcone and Paolo Borsellino died more or less because they were abandoned by the Italian state. It is likely that certain politicians were worried that their connivance with the mafia would end up exposed to the cold light of day and this may well be why Falcone and Borsellino were killed, or why someone turned a blind eye. Attempts to find out just who sold out Giovanni Falcone and Paolo Borsellino to the mafia are still in progress today – over 20 years after they were murdered. The mafia is regarded by some as a plague, and one which is damaging Italy’s progress. Hundreds of millions of Euros in mafia assets are seized regularly by Italy’s very courageous anti-mafia forces. Others in hold the mafia in high regard and many people in Italy’s south depend on mafia sponsorship to find jobs and keep them. And the jobs may well be found in seemingly normal businesses. These businesses act as fronts for mafia activities and are used to launder money, however other businesses won’t take on employees unless they get the nod from the local mafia boss. This is very similar to how Italy works anyway – non-mafia businesses in Italy will often only take on those who have been recommended to them. The parallels between the way Italy works and how the mafia operates are legion. By changing certain aspects of Italian mentality, the mafia would probably cease to exist, or that’s how I feel after having read this and Dickie’s other books. Being a mafia boss is no longer as attractive as it once was. Nowadays, and unlike 20 or 30 years ago, mafia bosses tend to go on the run, often for decades. Their lives become hell on earth – they cannot go out in public, and many have to live in hidden ‘bunkers’ from which they run their illicit affairs – until, that is, they are caught. More and more high ranking mafia criminals are being rounded up and this is likely to reduce the appeal of becoming a high level member of these criminal associations. It’s becoming more difficult for Italy’s politicians to operate in league with the mafia, although once upon a time, Italy’s political classes helped the mafia cover their backs. Recently departed former Italian prime minister, Giulio Andreotti was plagued by rumors that he had close links to the Sicilian mafia. Indeed, Italy’s courts were convinced Andreotti had been actively collaborating the mafia. Yet another former prime minister of Italy, Silvio Berlusconi is also suspected of being close to the Sicilian mafia too, as are a few of his associates up to an including Italy’s current, Sicilian, deputy prime minister. The supposedly southern Italian detesting Lega Nord party stands accused of using the services of the ‘ndrangheta mafia to acquire votes. The ‘ndrangheta orignally infested Italy’s toe, though it is now present throughout Italy. You’ll find out from John Dickie’s book just how the mafia has managed to accumulate and retain its phenomenal power and grip on Italy. Moreover you’ll discover how the mafia has combined its forces and how it continues to do so. Mafia Republic is a fascinating, if chilling, read. Recommended! Read it and decide for yourself whether Italy really is a mafia republic. on Amazon.com – but no price shown yet. There is a second hand copy though. The Kindle editions are out in the UK and the USA.